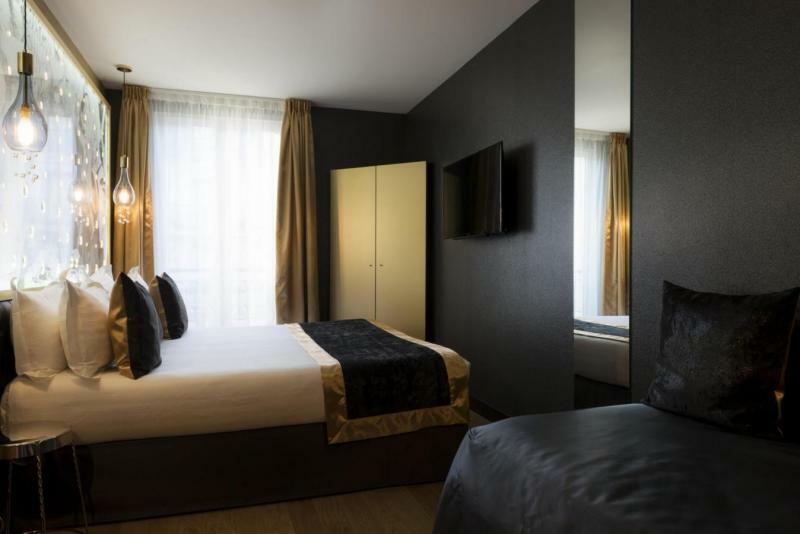 The hotel offers 8 business single rooms with a single bed. 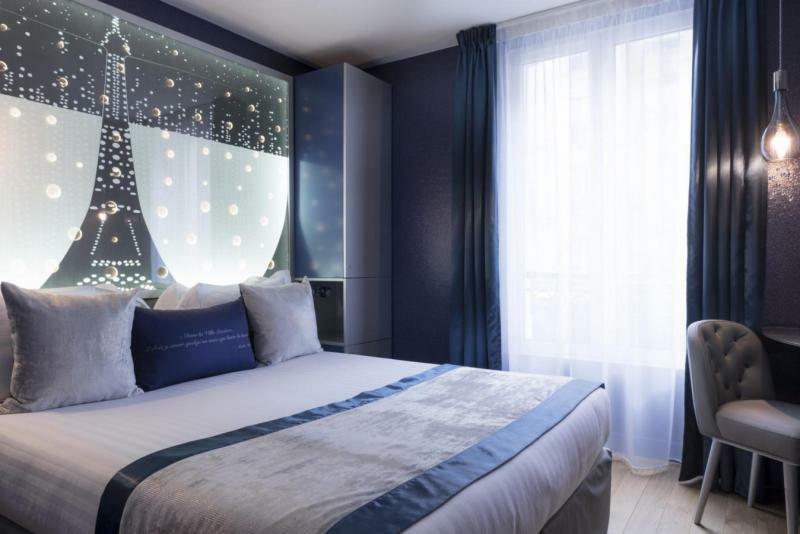 And because the well-being of our customers is for us essential, you can choose a view of courtyard or street. 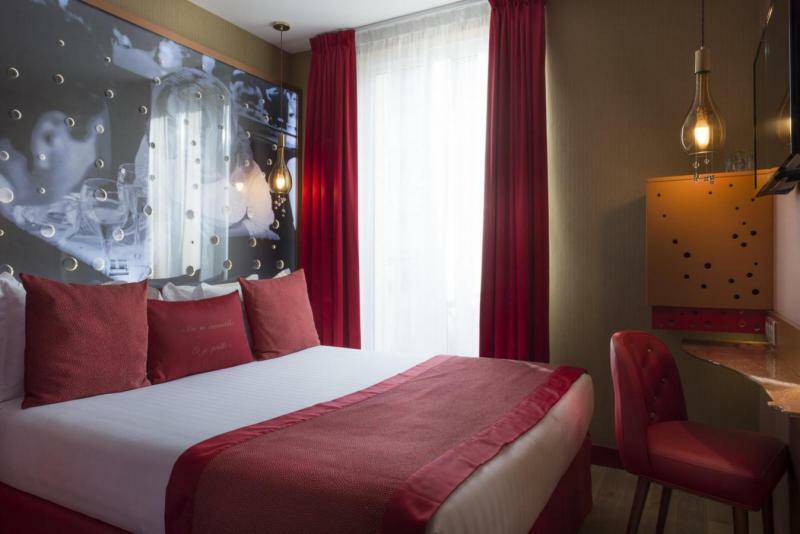 The hotel offers 8 Classic rooms equipped with a single bed. 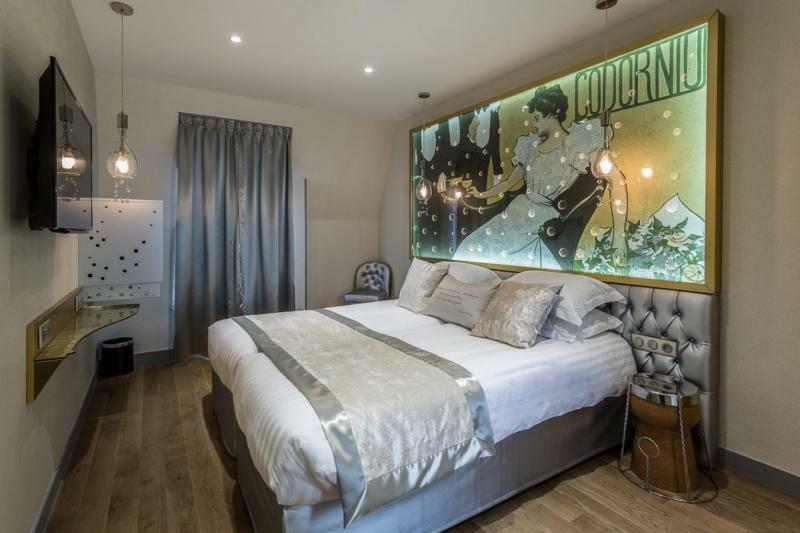 But, because for us the comfort of our guests is paramount, these single beds are a full 140 cm wide. 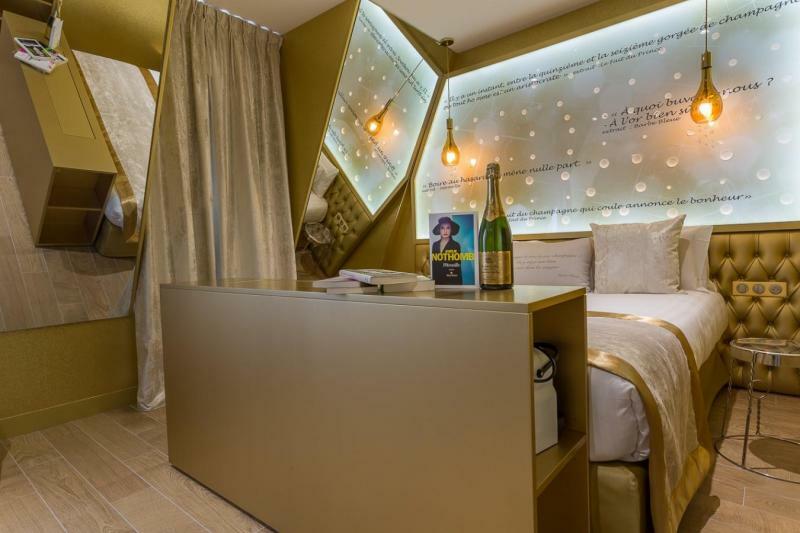 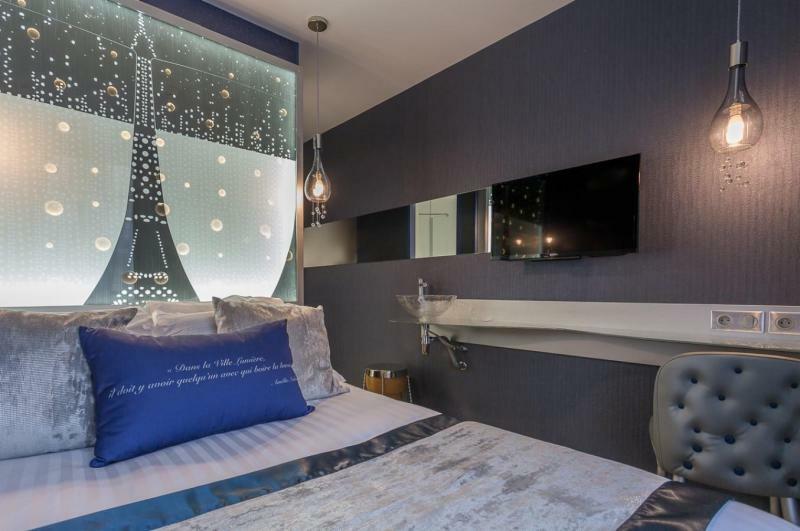 Fancy a nightcap in the privacy of your room? 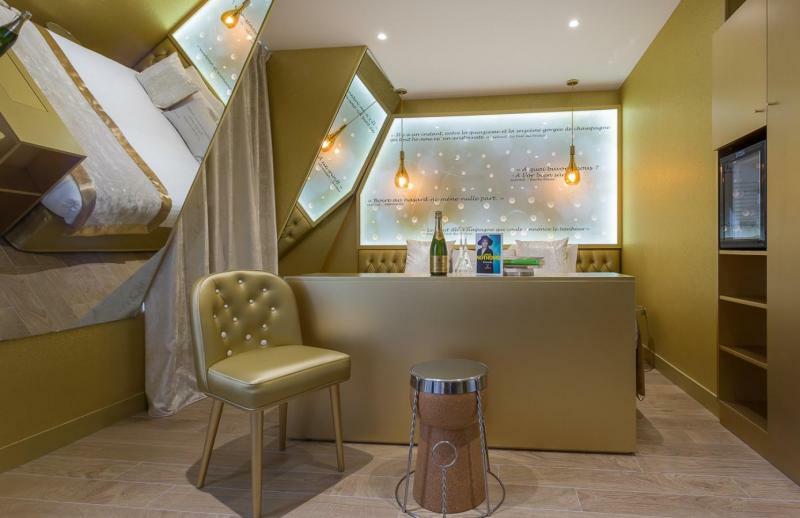 Open the mini bar, where you will find the Champagne and soft drinks. 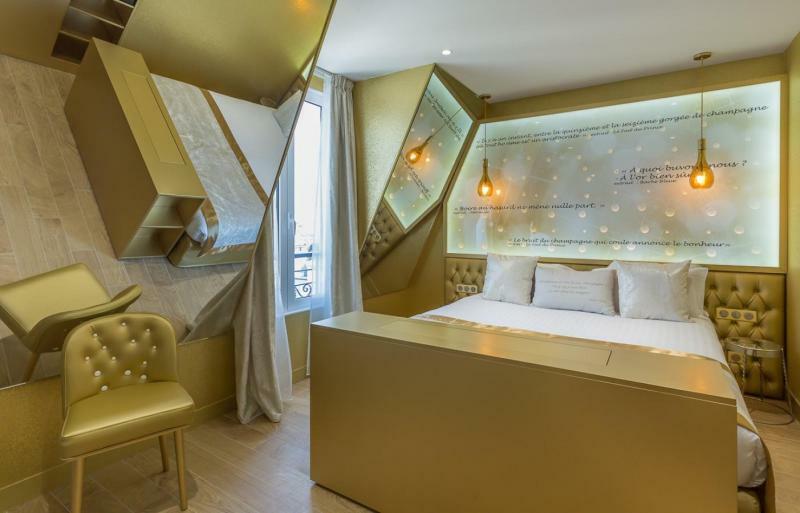 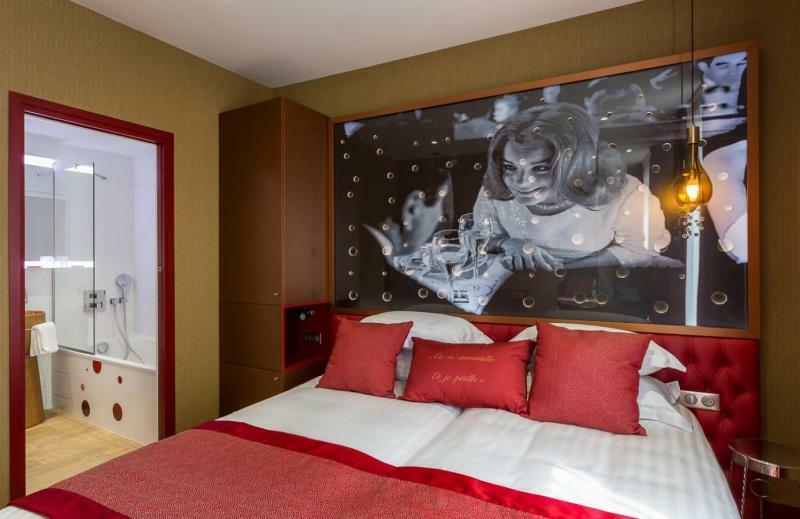 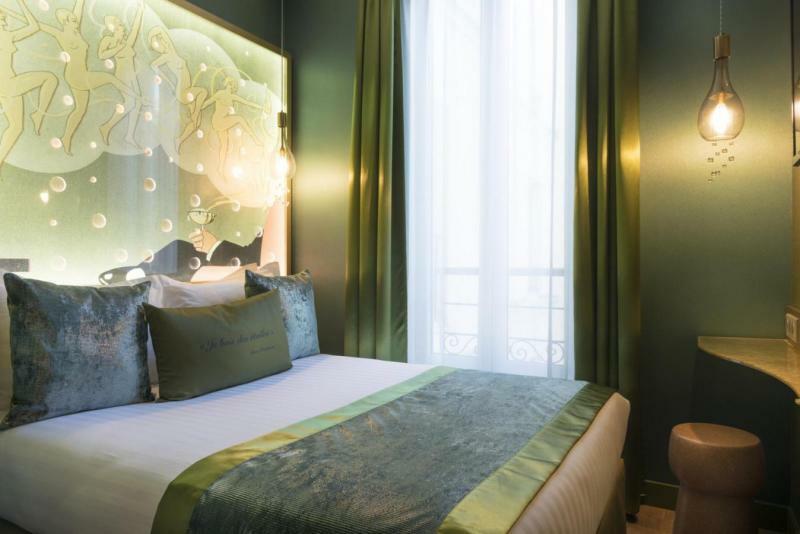 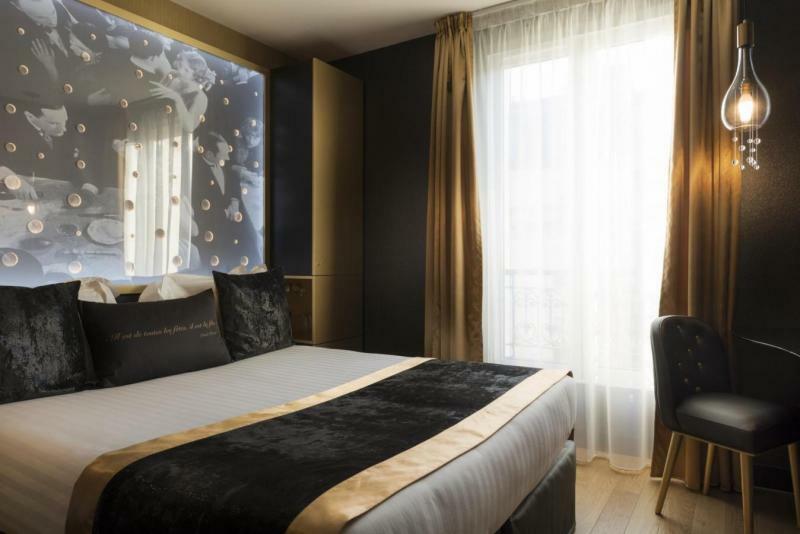 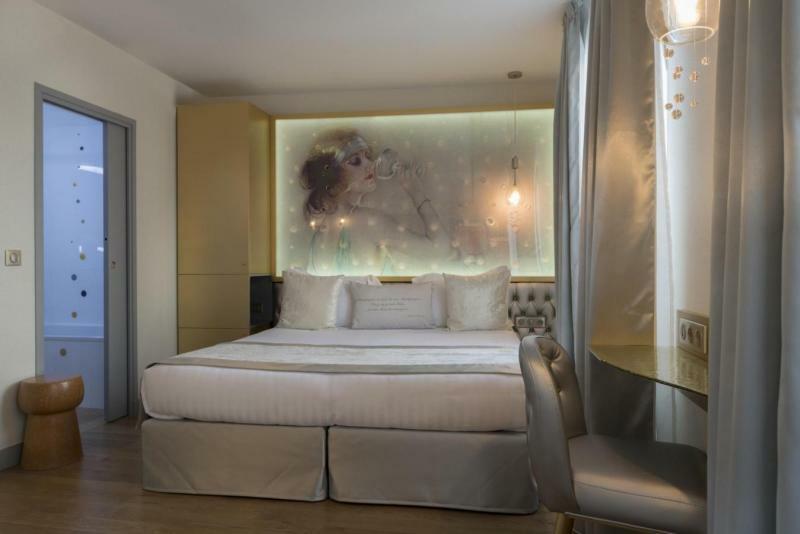 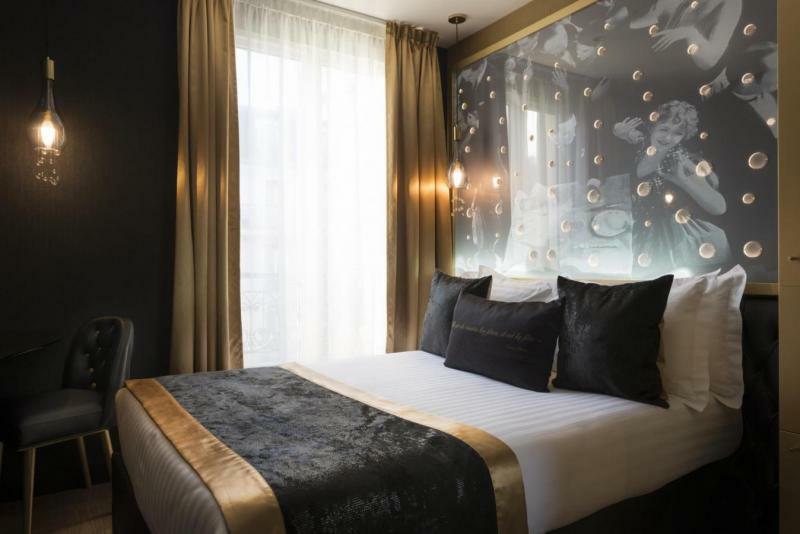 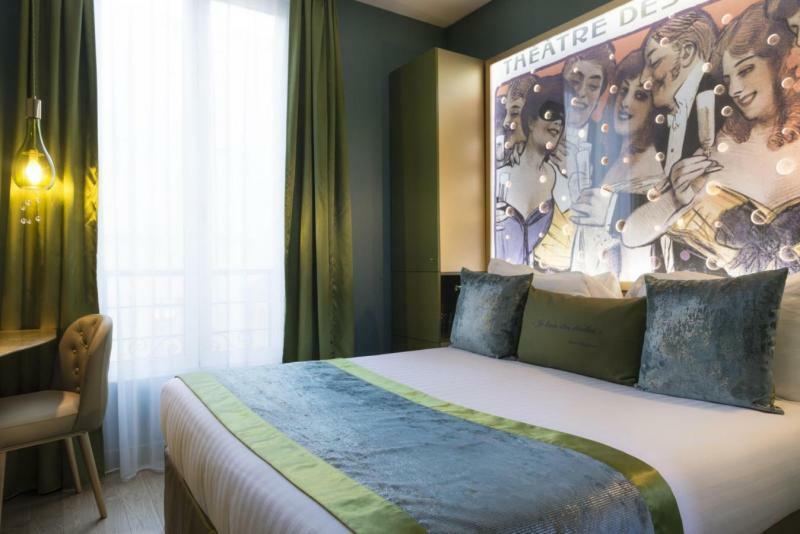 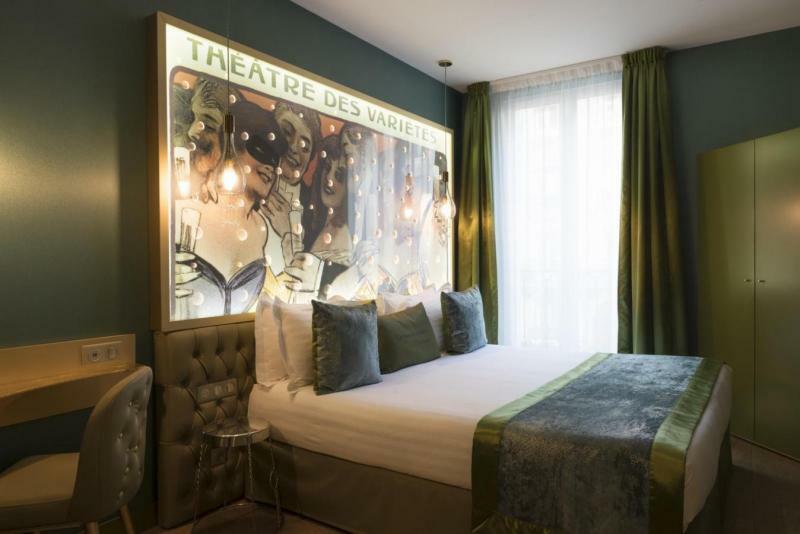 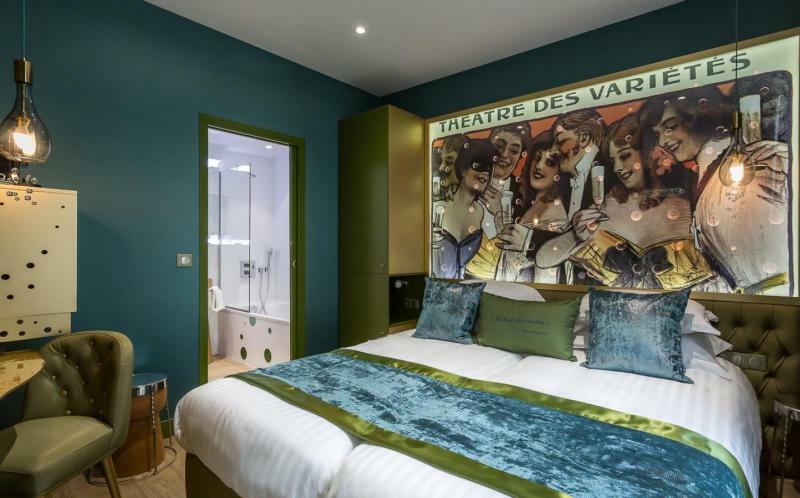 Six Privilege rooms welcome you for nights full of softness and comfort in the Latin Quarter. 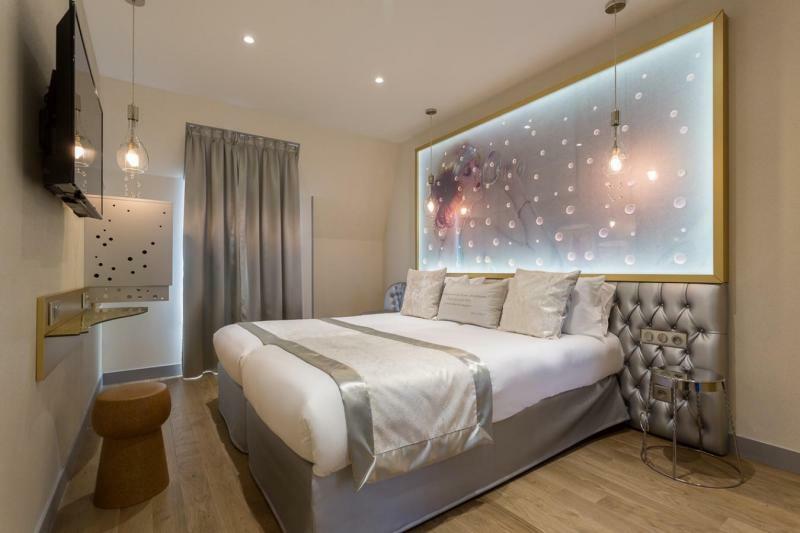 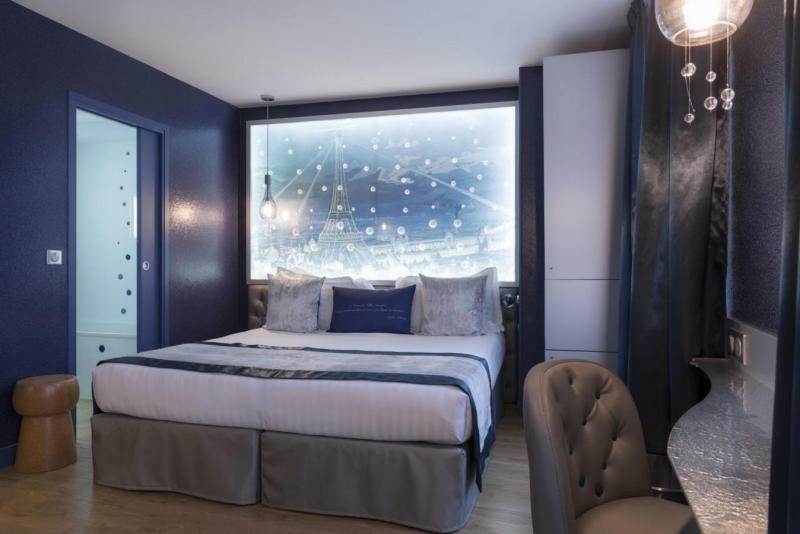 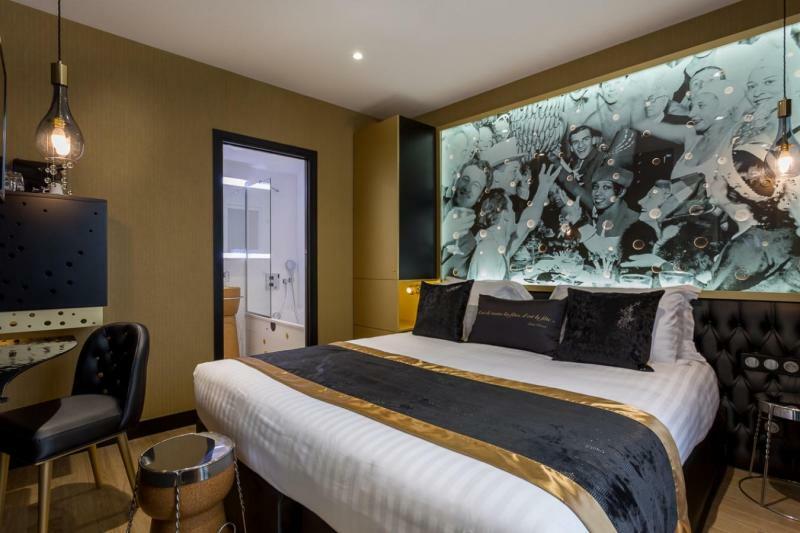 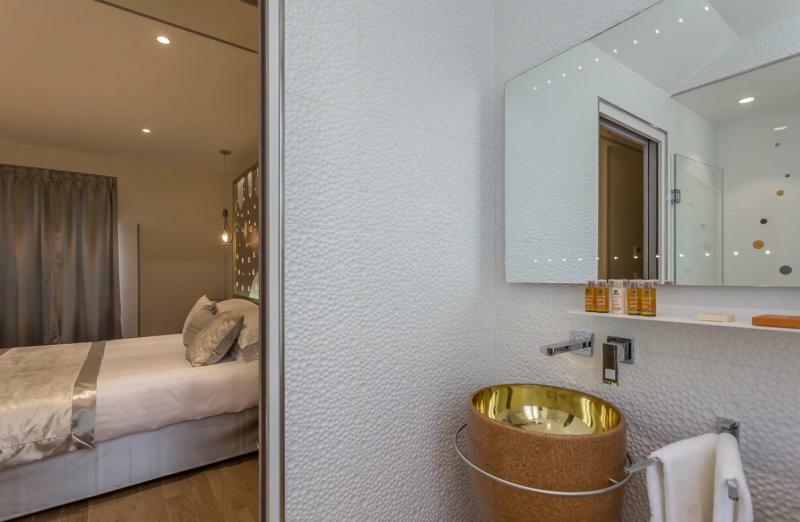 In a double room or twin room, according to your preference, you will have a bed of 180 cm in width, along with bathrobes and a Nespresso machine to use as you choose. 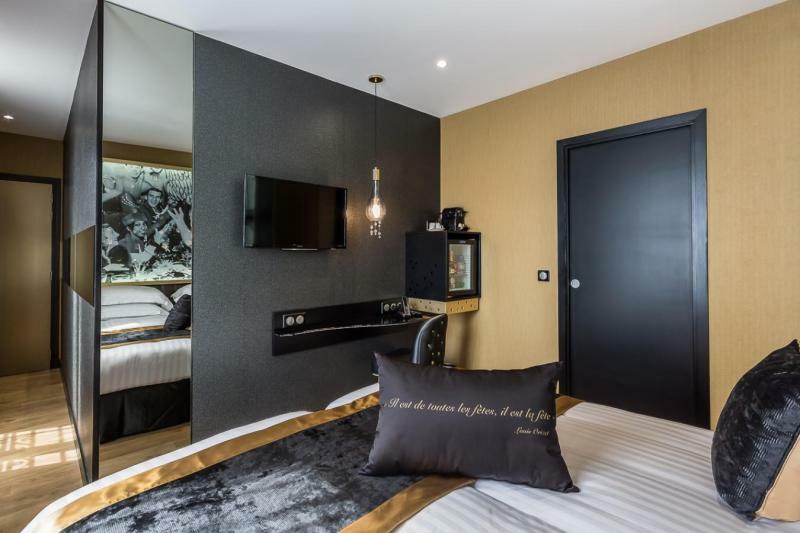 Additionally, as in all the rooms, you will find a mini bar with soft drinks and Champagne. 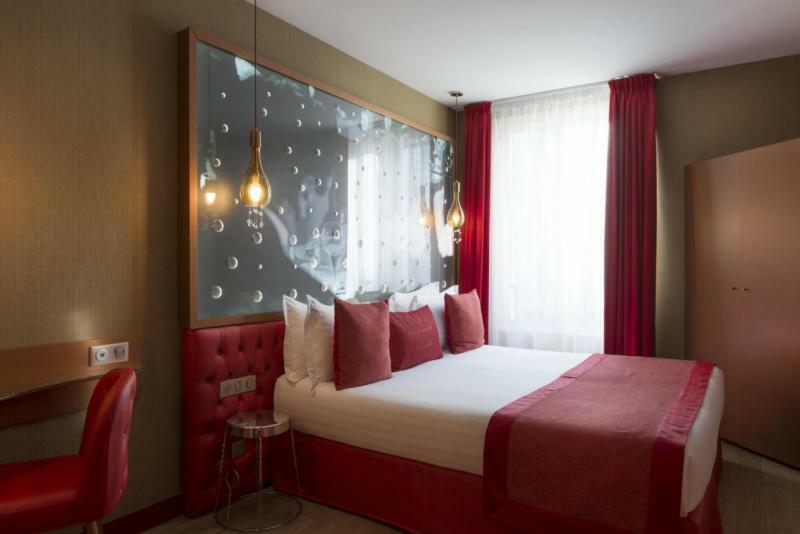 We have 8 rooms which are each designed to accommodate three people. 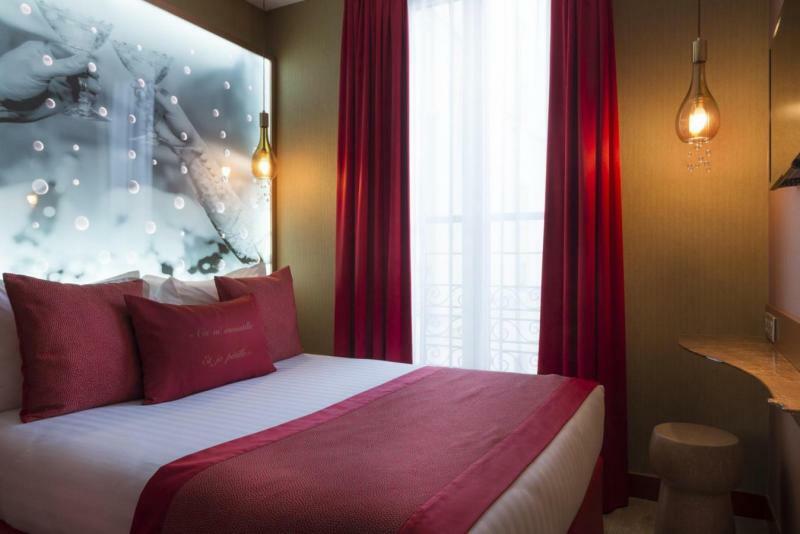 When making your reservation, please specify if you prefer a double bed and a single bed or three single beds. 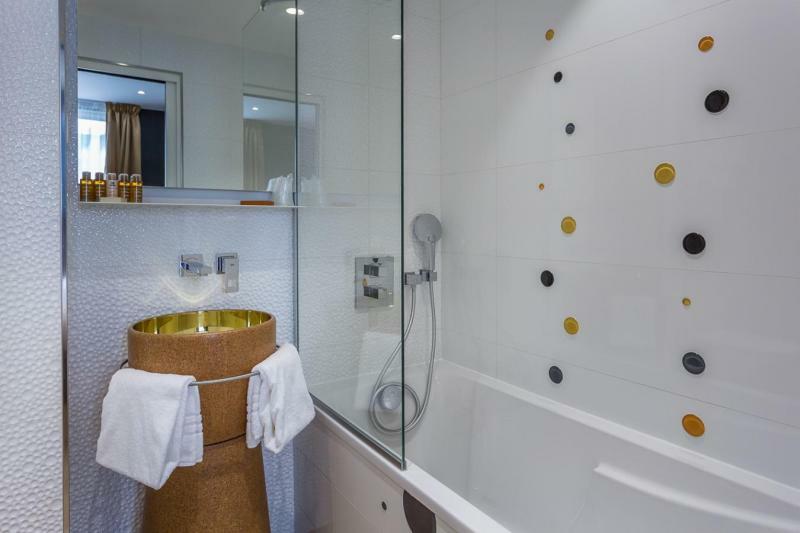 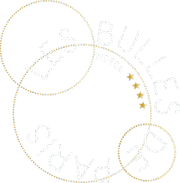 Bathrobes and a Nespresso machine are at your disposal in the Deluxe rooms, along with a mini bar containing Champagne and soft drinks. 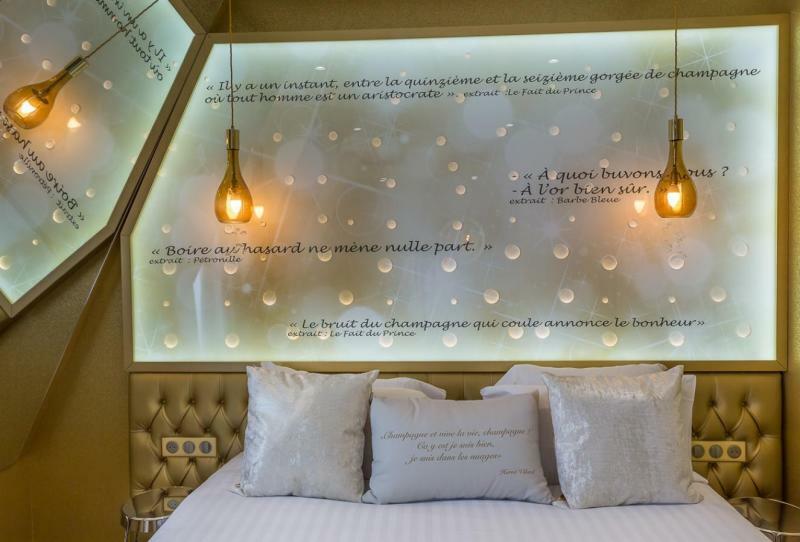 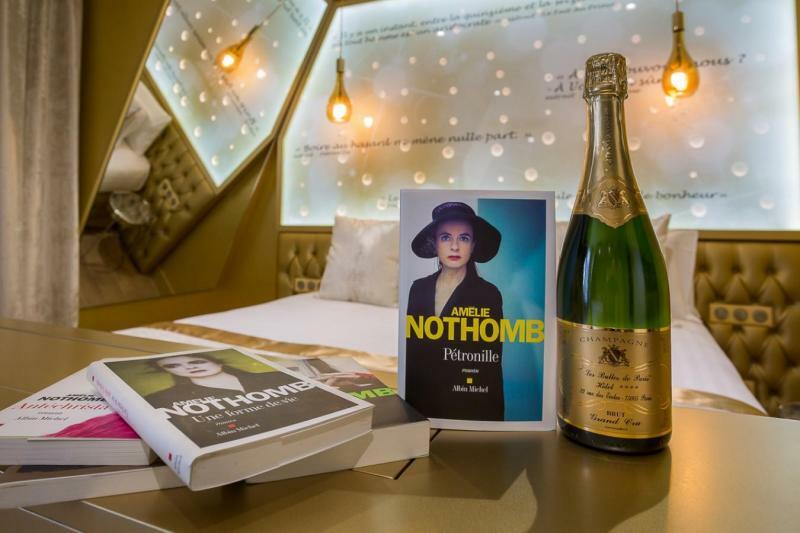 This room takes its name from the highly talented female writer, Amélie Nothomb. 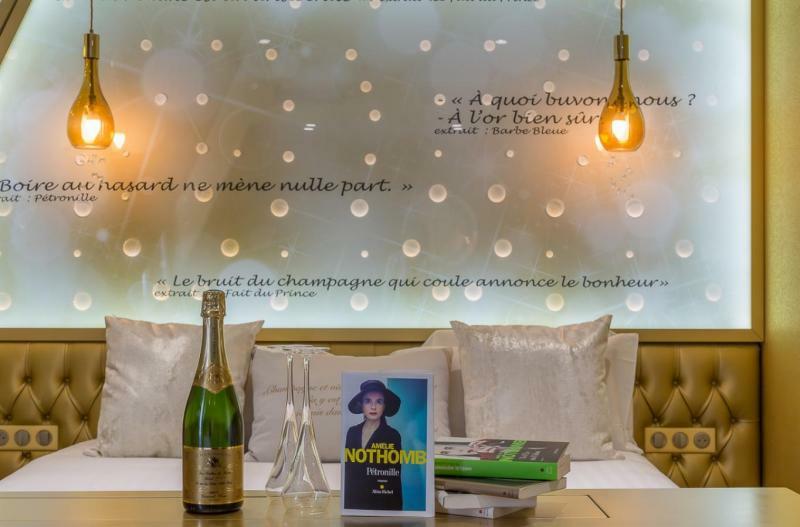 As references to Champagne are sprinkled throughout her work, it seemed natural and appropriate to entrust to her the decoration of this space. 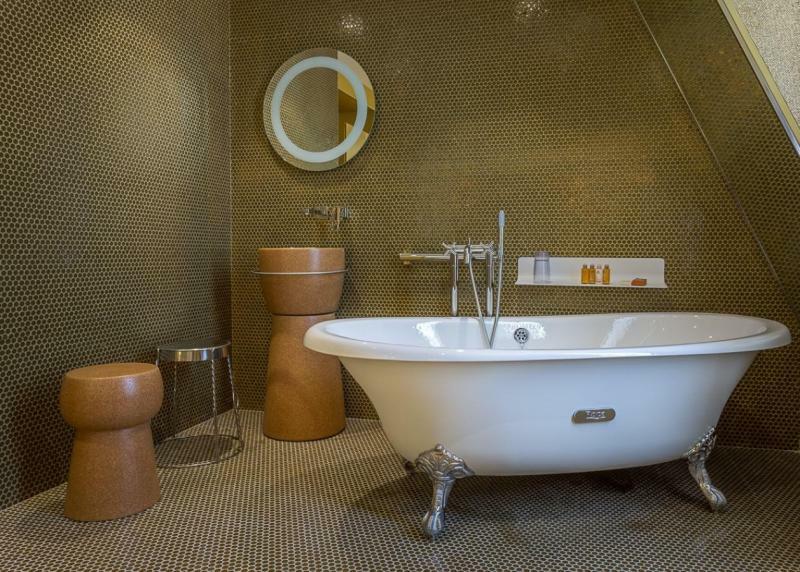 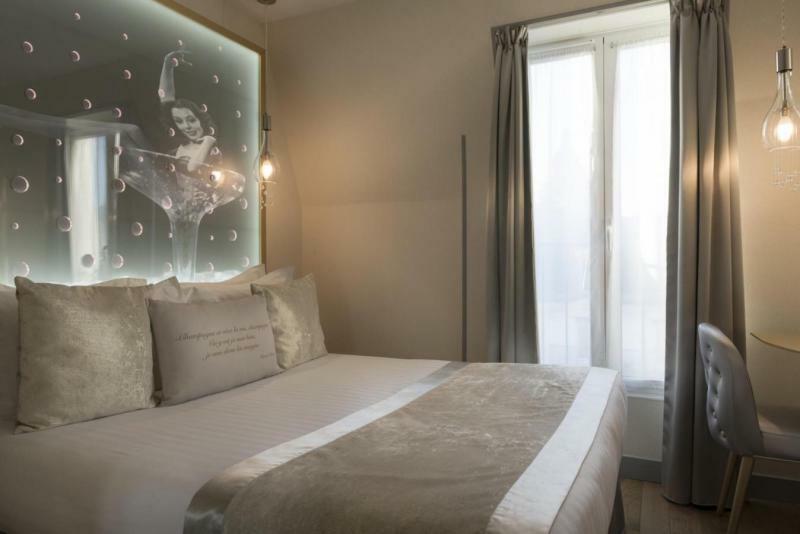 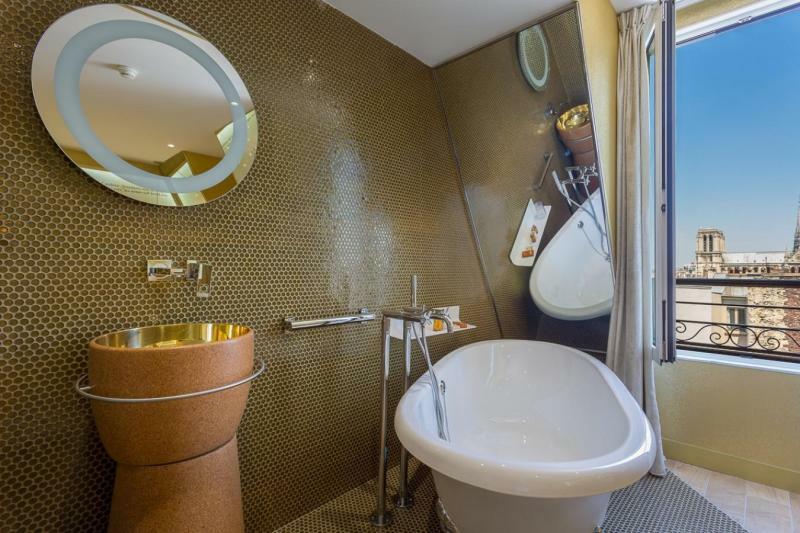 With its mini bar offering soft drinks and champagne, its bathroom open to the bedroom and a freestanding bathtub commanding magnificent views of Notre-Dame Cathedral, this room is simply unique. 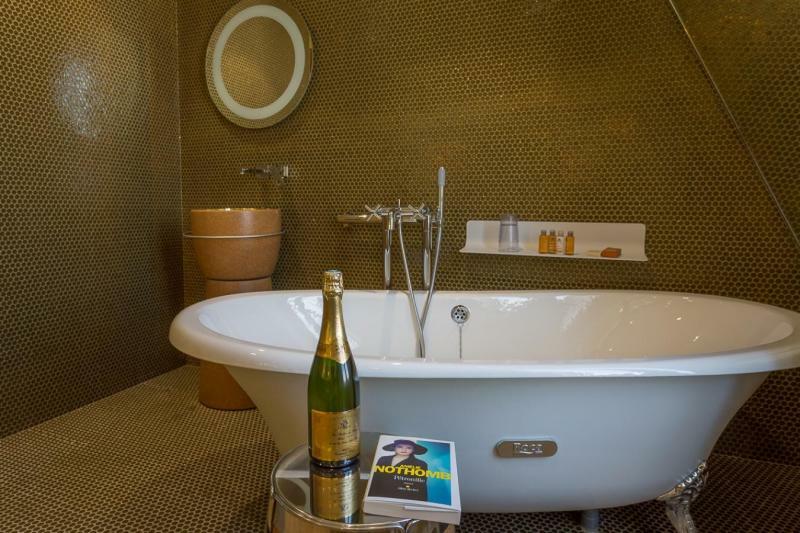 Do you want to take a bath in champagne? 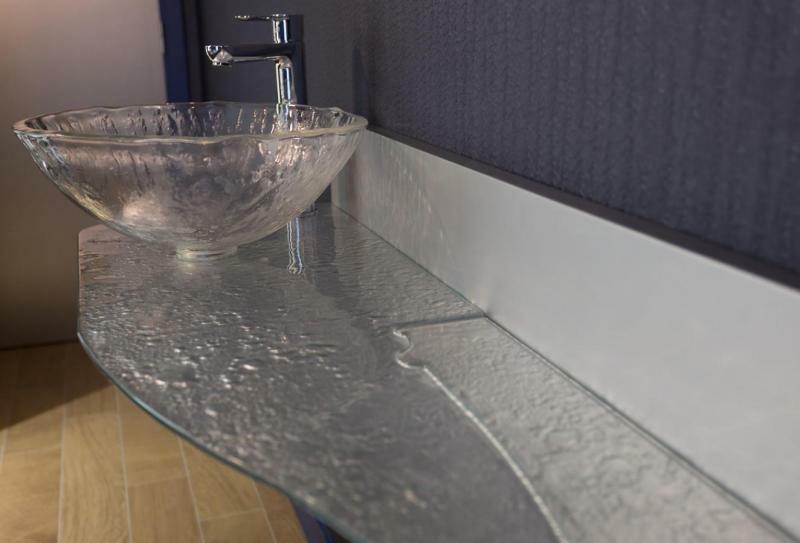 Please contact reception!